The Secret Service reported that there would be an investigation after an agent implied via social media that she would not be willing to defend President Trump if someone tried to shoot him. Kerry O’ Grady, the overseer of the Secret Service’s Denver district made it clear during the presidential campaign that she was a supporter of Hilary Clinton. 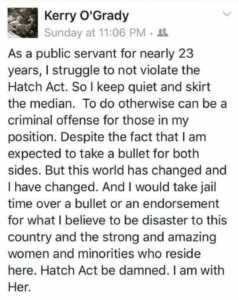 She has made several posts, which are now deleted off of her Facebook account, condemning the rhetoric of President Donald Trump when he spoke of his inappropriate behavior towards women and his offensive statements towards minorities during his presidential campaign; however, she did not mention him by name. This was first reported by The Washington Examiner. According to the Hatch Act, employees in the executive branch of the federal government are prohibited from engaging in political activity. This was also an issue that agent Kerry O’Grady made clear publicly that she did not support. Interesting picture. This woman looks more like a secret agent then like a politician.